Austin is a haven for outdoor lovers. With the Texas Hill Country close by, several rivers and lakes bisecting the area, and a handful of state parks within short reach, there’s an abundance of ways to spend your days outside with your family. We put together a guide outlining some of the best ways your family can share a memorable adventure in Central Texas. People may not initially think of caves when they think of Austin, but they are, in fact, plentiful. From those tucked away within the Barton Creek Greenbelt to Georgetown’s Inner Space Caverns to Westcave Preserve, you’ll find options for families who want an underground adventure. You can explore the rock walls within the Greenbelt on your own or book an off-trail caving tour with Inner Space that takes visitors into undeveloped sections of a cave hidden for more than 10,000 years. With 10 miles of the Hike and Bike Trail surrounding Lady Bird Lake and a plethora of water activities on* *the lake itself, downtown Austin’s Lady Bird Lake is a perfect destination for family outings. Take a stroll along the banks of the lake whether you prefer to cruise on two feet or two wheels, or, rent canoes, kayaks, or SUPs for a day on the water. Barton Springs is an Austin classic. A spring-fed pool in the middle of Zilker Park just off of Barton Creek, Barton Springs maintains an average 68-to-70 degree temperature year-round. While the cool water may be a relief on a hot, summer day, it’s also home to the New Year’s tradition of a "polar bear plunge," with folks of all backgrounds and ages taking a plunge on the first day of the New Year. Just one hour southeast of Austin, you’ll find Palmetto State Park, an unusual forest overgrown with tropical vegetation like the palmetto plant. The only park with tropical vegetation in the state, it’s a beautiful and mysterious park that has a Jurassic feel to it. As you stroll along the flat trails that cut through the forest with algae-covered swamps beneath the palmettos, it feels like another world—certainly not one you’d expect to find in Central Texas. Alternatively, rent a canoe or kayak to take on the murky swamps. 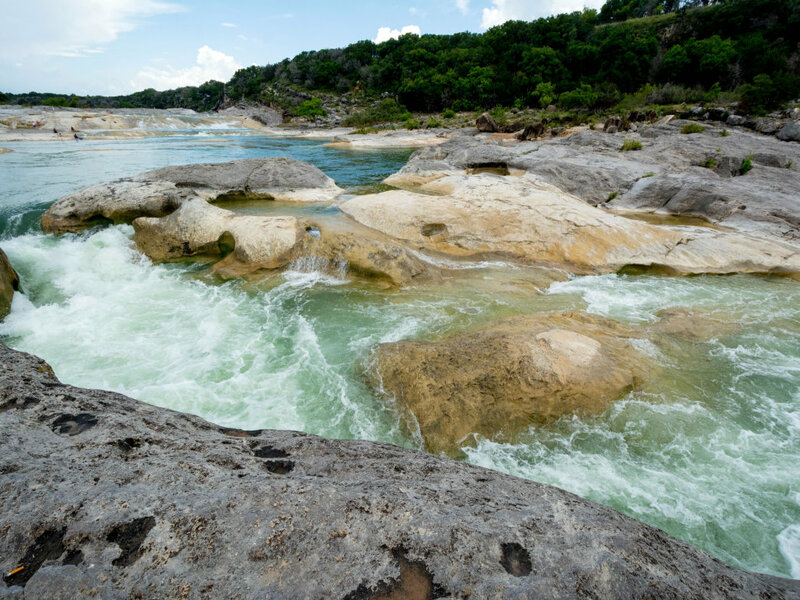 Pedernales Falls State Park is a wonderful getaway for many activities. Pack up the car and set up camp for a weekend of camping, hiking, and stargazing amid one of the area’s most beautiful landscapes. 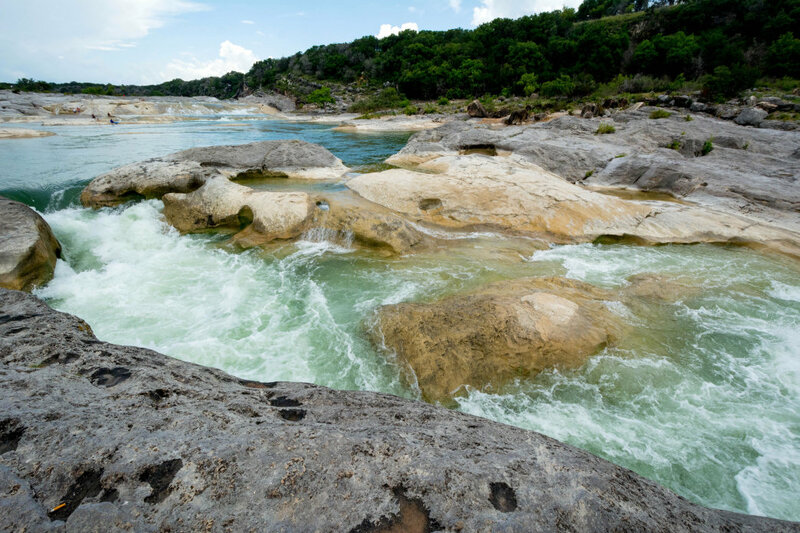 Enjoy white sandy beaches, giant boulders and rock formations, and overlooks that offer expansive vistas over the curvature of the Pedernales River. At night, it’s a popular spot to enjoy the wide-open sky full of stars. Without light pollution near the state park, the night sky reveals incredible displays of the Milky Way and planets. About 45 minutes outside of Austin, Spicewood, Texas, is home to Cypress Valley Canopy Tours—an incredible facility with a handful of zip lines set up in the canopy of its giant cypress trees. Tours are available both during the day and in the evening, and if you’d like to spend the night, you can take advantage of one of its treehouses that are scattered about the property. About 20 minutes outside of Austin you’ll find Cook’s Canoes in Webberville—an old school canoe outfitter situated on the banks of the Lower Colorado. You can rent canoes or kayaks for 7-mile, 11-mile, and overnight trips along the river, which is a wide, generally calm section of water. Mount Bonnell is another longtime Austin favorite, which overlooks Lake Austin. A steep climb up concrete stairs, it’s a relatively short hike with an amazing reward at the top. Why not pack a picnic and head up late in the afternoon? (It’s a beautiful place to watch the sunset.) Insider’s tip, while you’re in the area, stop by Laguna Gloria, which is part of The Contemporary Austin. Its grounds are beautiful and feature an outdoor sculpture gallery, and neighboring Mayfield Park is home to incredible gardens and peacocks, both of which make for wonderful photo opportunities. If family yoga is more your speed, join Yoga Hike for one of its excursions to nearby state parks for a yoga and hiking combo. Usually held on Saturdays, Yoga Hike plans adventures in parks just outside of Austin, like Pedernales Falls State Park and McKinney Falls, for dual hiking and yoga adventures. It’s a unique way to explore a trail while working in asanas and guided meditation by the host. Written by Ashley Halligan for RootsRated in partnership with Austin CVB.